A textbook that is not written like a textbook. Students learn astronomy by doing astronomy. At Play in the Cosmos is a first-of-its-kind resource in astronomy education. Jeff Bary (Colgate University) and Adam Frank (University of Rochester) worked with the nonprofit Learning Games Network to develop a mission-based online videogame where students can fly up to twenty missions that span the entire scope of the course from basic physics to cosmology. 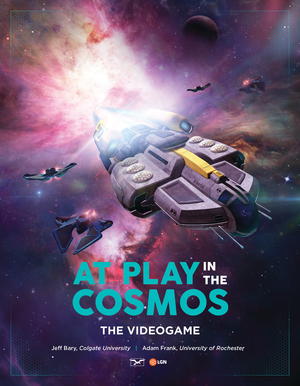 At Play in the Cosmos is the product of close collaboration in three fields: game-based learning, video game design, and teaching introductory astronomy. Astronomers Jeff Bary and Adam Frank worked with the nonprofit Learning Games Network (affiliated with the University of Wisconsin and the Massachusetts Institute of Technology) and W. W. Norton to develop the game. The theme of exploration drives student gameplay through a variety of narrative and collection missions. In the guided, narrative missions, each student assumes the role of a search/survey/rescue contractor. The game’s Cosmic Operations Research Interface (CORI) guides students through achieving goals, like finding a habitable exoplanet or redirecting a rogue comet. Along the way, students are asked to choose the right scientific tool for the task, putting underlying course concepts to use. Thirty Interactive Simulations, available as reference tools within the game, introduce basic concepts through multiple representations: variable view, numeric view, and graphical view. All simulations are controlled with just one or two sliders to help students focus on learning the concepts rather than just fiddling with the controls. At Play in the Cosmos reports data on students’ gameplay back to the instructor, so you can track time on task, mission completion, and students’ patterns of selecting the correct (or incorrect) scientific tools for each mission. The game is available with every copy of Adam Frank’s textbook, Astronomy: At Play in the Cosmos, at no extra cost for spring 2017 classes. For fall 2017 classes and beyond, access can be purchased standalone or packaged with any W. W. Norton introductory astronomy text.